Although this blog is aimed at skiers, there are many xc skiers who also like to snowshoe. Share your information with others on this page. Chuck and Dianna P. lured me to Chickadee Valley on this gorgeous day. Frank, our exceptional Meanderthal Snowshoe Leader took 18 in total to about 4 kms into the valley. Most of us hiked in using grippers, and many decided to snowshoe back out. My feet disappeared a few times to below the knee in the transitioning snow but no one went for a cool dip. That was a neat picture Dianna of the narrow snow bridge, which deteriorated further today. I can only imagine how tough a ski it was for you yesterday, Dianna. Great to be back in that beautiful valley after not being there for 6 years. Thank you, Helen, and I must confess we found skiing out quite a challenge, and took just as long as skiing in! From Johnson Lake parking we followed the plowed road to the “water tower” (actually a surge tower on the penstock for the Cascade Power House) From there we set off following a snowshoe track along the “bike trail” to the Cascade Ponds picnic area. Along the bank above the TC Highway there are great views of the north facing cliffs of Mount Rundle. We enjoyed lunch at the Cascade Ponds in the warm sun and no wind. Continued onward to the south gate closure of the Bankhead road and finished at Lake Minnewanka parking. The Bankhead road is groomed and trackset for skiing from Upper Bankhead to Minniwanka parking. Time was 4 hours for 10 km snowshoe on established track. A great moderate trip requiring a car shuttle. Kudos to the Seniors’ Outdoor Club Members who set this track Tuesday. Our merry band spike hiked trail numbers 18 and 27 at Lake Louise on Tuesday the 22nd. #18 as far as Mirror Lake was quite well packed and we spike hiked it easily. We then continued on the #18 loop and it would seem that most people just go up to Mirror Lake and then head back down the same way they came as the second part of the loop was much narrower and much less packed. We met no one else for the rest of the day. We were spike hiking but snowshoes would have been good too as we post-holed from time to time on the edges of the trail. Temperatures were around -10C and I imagine on a warmer day snowshoes would be essential. #18 joins nicely into #27 giving a total distance of just over 10 km. # 27 crosses some of the ski trails and also the dog sled trails (look both ways before crossing!) as is loops through the flats behind the Chateau. I can’t find any maps on-line showing these loops but there are good maps at all trail intersections, marker poles along the way, some that are just poles and some with the trail number so it was relatively easy to stay on our intended track. It was only right at the end that we couldn’t figure out where the snowshoe track was and so we hiked the last 200m or so along the ski track (staying right to the side and avoiding the track set!) One of our members had picked up a map at the Chateau last year showing these tracks so you could ask in the hotel for a map also. Snowshoe around the lake was beautiful. There was fresh snow and it had been packed for a great trip around the lake. There were a coyple of trees down across the trail andwe were able to either go around or under them. The trail across the Lake looked in good shape too. All in all a wonderful day in paradise. Sat Jan 5th – Great Divide/Ross Lk/unnamed trail below Narao glades/lake O’hara Rd loop – beauty day with some hearty trail breaking for pretty much the entire route until the o’hara Rd. Started at Lake O’hara parking and did the loop clockwise. Knee deep on the trail and thigh to waist deep if one steps off the trail. Temp around -8, no wind. Trees absolutely caked with snow. Lots of avie bombing on the slide paths on west side of the highway. SHERBROOKE LAKE – December 24th…..we snowshoed up to Sherbrooke Lake in beautiful winter wonderland conditions. A nice destination. Did Boom Lake today. Lots of great snow for the snowshoes . Went out for an afternoon snowshoeing. We took snowshoes (silly us) and ice walkers (Just in case) Neither were needed along Snowshoe Hare as winter boots worked just fine. Indeed, we could have used sneakers on all but the steepest ups and downs. A lovely day in the mixed aspen/pine forest. Chester Lake. Not enough snow anywhere that is dog-friendly yet to ski so my humans took me out on their snowshoes to Chester Lake – I’m so happy to be back out on snow as I’m an Alaskan Husky! We followed the official snowshoe track (not the ski trail) all the way to the lake, which had been packed before us, then continued on past the Elephant Rocks and up to a small bumpkin above with great views. My humans measured about 20 cms at the trailhead and 40 cms at the Elephant Rocks. Off-trail I was post-holing a bit. Explored the Pipestone area by snowshoe today. The parking lot and about 1 km of Pipestone Loop trail (ccw) from the lot is officially closed for tree removal. We entered the gate leading to Hector. No more ski grooming there this year and not a skier to be seen. Ski tracks were eroded by the sun to be non existent. We traveled cw on Hector, Pipestone Loop, Merlin, Drummond to Mud Lake. Found old snowshoe tracks along the lake leading back to Pipestone Loop close to the trail closure. Traversed west from there through the forest to the Pipestone Loop trail descending from Pipestone Lake and found our way back to Hector and the exit gate. We passed a few trail closure sandwich boards on our way but never entered the officially closed area. The Pipestone area has so many open areas throughout the forest it is a wonder there are not more snowshoe trails. What a gorgeous day! Good snow all the way around the loop except for one mud spot at the top of a hill that can easily be bypassed. Only saw 4 other trail users. Our CSC/CORE group snowshoed Chester to Sawmill via Frost Heave & Graupel yesterday. Idea was to take advantage of more downhill gradient in that direction & when we found that we had to break trail on Graupel the downhill gradient certainly helped. Midwinter conditions in April are still easily enjoyed. Snowshoed the southern part of the High Rockies Trail today, Peninsula to Black Prince. Wanted to see the impressive new suspension bridge over Black Shale Creek; it did not disappoint. There was plenty of snow, about 3″ – 4″ inches of fresh un-tracked snow for the majority of the trail. We did have other snowshoer tracks between the bridge and Black Prince, but otherwise it was just moose, rabbit and squirrel tracks. We saw a few tracks crossing the trail going who-knows-where… don’t follow them. Oops, didn’t mean to make it sound like the snow depth was only 3 – 4 inches. It was deep, with 3 – 4 inches of fresh on top. Resigned that there has been no new snow, I enjoyed my third ICE WALK today on Banff West Spray down to the Bow River Bridge. Since buying a pair of heavy duty Stabilicers from Switching Gear in Canmore for sale price of $49.95, I have done the circuit of Johnston Canyon Upper Falls/Moose Meadows circuit and Grotto Canyon, which are both advertised in “Discover Banff Tours”. We ran into a tour group at Johnston Canyon and the participants were using these same great cleats. I love mine and might go back to Switching Gears and buy another pair. The red rubber pull-on mini crampon cleats work great too. There were a lot of rocks frozen into the ice on West Spray…maybe Bob should host a back-breaking rock clearing party there while we await snow. Like Chuck, a group of us were in exploratory mood to check out some new snowshoe trails that the Fairmont Chateau Lake Louise have created. We started snowshoeing at Great Divide and within 100 M. turned right onto Blue #27 trail. It was snowshoe packed and crosses once each: Lower Telemark #8, Peyto Blue #7, and Upper Telemark Blue #5. We came to an intersection with snowshoe trail Green #28 which is 1.5 kms. towards Ross Lake summer mountain biking trail but stops with signage at an avalanche danger area. There is also a Green #26 Lake Agnes loop which we did not try. We went down to the Chateau for a photo op and continued back on our original loop #27. Total distance 7 kms. with 220 M. accumulated elevation over 3 hours in a Winter Wonderland!! Kudos to the Chateau for creating all these new snowshoe trails. I am keen to explore #17 Blue next as it is 4.5 kms. one way and appears to parallel Fairview but higher. A map of these trails is available at Lk Louise Info Centre and perhaps where they rent snowshoes at the Chateau. Like Chuck and Jeanette, it was most enjoyable today exploring something new. Tried Marsh Loop in Peter Lougheed Prov park today, from the William Watson lodge. It’s a scenic little loop, but it barely had enough snow. Cover was complete, but 1 or 2 cm of fresh snow disguised a few baseball-size rocks in the first section of the loop. Trail Head at Highwood Pass at 10:30, -5 deg C. It appears we were the first on the trail since a large new snowfall and we had to break trail through snow that was knee deep to up to my waist (obviously off any former trail at this point). Very tiring. No wind in the trees but once we broke tree line, there was a brisk breeze. We reached a bluff where the wind had blown the snow off. We were greeted with the pleasant appearance of about 10 ptarmigan. They were beautiful, some half buried in the snow to keep warm. Once again, a fantastic day in the mountains. I am mainly writing this to let people know that there was a couple that started before us and broke trail directly across from the Highwood Pass parking lot. Probably not good to take this trail, even though it initially looks inviting. Walk up the road to the start of the actual trail. They eventually gave up and had to go down the creek valley and back up to the other side to the original trail, which happily for them, we had groomed. I forgot to mention that we had snowshoed this on Monday November 20th. Nov 13/17, snowshoed around Ford Knoll in Elbow Valley area. Wonderful views of Nihahi Ridge and plenty of good snow all through the hike. Great to be able to access these trails before the Dec 1 highway closure. It says something about updating to enable third party hosting? Oh, now I see it! Copy and paste works better than clicking on the link, for some reason. It’s a real joy when I can play in the snow near Highwood Pass before the winter gates are closed and so, when one of the Ramblers co-ordinators called a snowshoe trip to Little Arethusa (just south of the Pass), I jumped at the chance. Five hearty souls headed out yesterday (Nov. 10) at 8 a.m. under somewhat sullen skies and warming temperatures, not really knowing what to expect as we hadn’t had reports on snow depth from that area. Well, I wouldn’t have wanted to ski the terrain, even on rock skis, as the depth was marginal in the trees and the snow was often wind-crusted over sugar higher up. Even with pretty aggressive claws on the shoes (MSR Lightning Ascents), we had to work hard to make the summit. That being said, the day was splendiferous! We had a pretty chilly wind at times but, as is sometimes the case, things calmed down near the summit. The skies cleared every once in a while and, by the time we were coming down, I was wearing only my light fleece. And yes, there were ski tracks. In fact, we saw 2 skiers coming down a shallow gully just SE of the “bench” one reaches at tree line. We were snowshoeing Galatea today, my sister took off her snowshoes after the first suspension bridge, and when we came back they had disappeared. They are black and made by MSR. If you have any knowledge of their whereabouts, please respond. Glorious conditions for snowshoeing at Sunshine Meadows today. Several inches of fresh snow. Around 0c all day with lots of sunshine. A few backcountry skiers around, otherwise we had the place to ourselves. Snowshoed on March 16th from the Chester Parking Lot and headed towards Sawmill on the Snowdrift Trail. Took the spur up to Mt. Murray Viewpoint and then headed back taking the Frost Heave Trail on our return for a 7km loop. ABSOLUTELY GLORIOUS as we had fresh snow. Our group of 7 took turns breaking trail all the way and had loads of fun running down the trail (when it was going down!). Great Snowshoe trail, and wolves liked it too! We were able to stay on a rain crust! I’m shocked Chuck! Were you actually snowshoeing? Snowshoe Hare trail at WBC – hiked the trail today using only boot traction- mixed bag of mud, ice and snow. Beautiful day! We headed out to Sandy McNabb today to snowshoe the Death Valley/Long Prairie Loop. With the weekend’s heavy snowfall, the trail has been filled in and although we had intended to stay on the Death Valley loop trail, we ended up on the Long Prairie Loop connector and came back down the Death Valley trail to the road again. Not the intended outcome! We then got on the Long Prairie Ridge trail from the information centre trail head and snowshoed along the ridge for a couple of kms, but turned back before intersecting with the Death Valley trail again. It was a good day out in the fresh snow but next time I’ll have a GPS track loaded up because the trail markers are few and far between and you can’t always trust that the snowshoe tracks you can see are the trail you want to be on. Chester Lake: 1pm -14 I remember reading Alf’s hilarious and frustrated backcountry report on Chester Lake from Nov 19th/16. Had not put on the mini (child) MSR’s this year so decided to check out the snowshoe route. It was well packed down so I had an enjoyable afternoon “track-shoeing” (as I call snowshoeing on a packed trail) with lots of snow falling during my short outing. The bright orange snow-shoer signs were placed well for this in-out snow-shoe trail and I met a large group using rentals coming out. There were 2 cms of fresh powder on top of my car so this would be a wonderful x-c ski for tomorrow. Only saw one skier at the end but that is because the trail is so well separated now. Didn’t check first but, want to add it to Resources Bob? -2C in the Chester Lake parking lot when we started our 4 hour snowshoe to Chester and the Elephant Rocks. It was one of my better days into Chester – the snow is still cold with no ice on the trail, there was a scattering of cloud to keep the snow cool and not a breath of wind from the chinook. Ate lunch on top of an elephant. Snow off track is bottomless making for interesting wanderings. With snow conditions as they were I decided not to try the the Chester Creek draw out to the paring lot. This must be the most popular snowshoe trail in K-Country considering the width of the trail when the trees open out. There were lots of other people enjoying this perfect day – over 50 cars in the parking lot when we finished at 2:00 pm. Lots of snow along Smith Dorrien. Snowshoed Hogarth Lakes with several folks from Calgary Nature Lovers on Monday, Dec 19 – deep fresh snow, but chilly (-10), but a great day. No sign of the car-licking moose! We have CHOICES for the weekend! Get away from the crowds at MLR, and enjoy the cold fresh snow which makes it easy to control your speed! Why would you snowshoe when you can ski? PLPP: + 2 C and raining Started from WWL on my new snowshoes and finished at Pocaterra Hut. We started “bushwacking” from Spruce Road following old barely visible tracks across lovely meadows that took us close to the junction where Lodgepole crosses Braille. From there we found our way up the hill that overlooks Lower Kananaskis Lake and Canyon parking. We followed moose tracks all through the forest spotting many of their beds. After an uphill surge we were on top of the ridge where we came across snowshoe tracks that led us back down to Canyon parking. This completed the hard work then we crossed the LKL dam and traveled up the Penstock snowshoe trail to the Kent Creek sluiceway and back over the seven hills to the now buried penstock, the powerhouse and Pocaterra Hut (10 km / 380 metres elev gain and 460 metres elev loss.) A nice day of snow showers and sunshine tromping around the bush. I love your sense of exploration in bushwacking off the beaten path. It the way snow shoeing appeals most to me. Thank you for the reply. Yeah, and it shows that we don’t always have to be on top of a ridge, or dangling on a cliff’s edge to get that sense of wonder. It can be your moose trail secretly winding through the bush, or that sunlit meadow tucked away from everywhere else. Chester Lake: The snowshoe trail to Chester Lake was icy hard (like concrete) but was covered with a cm of new snow. We walked around the Elephant Rocks and returned. We followed tracks down Chester Creek into the 2013 flood damaged zone and turned back. We didn’t want to get too committed and have to climb out of the gorge. Can anyone tell me whether it is possible (and fun) to walk out to the Chester parking lot along the creek? Yes, it is very possible and very much fun to walk out to the Chester parking lot along the creek, when there is enough snow coverage. I’ve skied up that way, which was sort of like snowshoeing. Coming down on skis would have been challenging! Had an hour to kill, so did a walk here. Gorgeous in the sunshine. If one stayed on the well-used trails, snowshoes were not necessary. (IMHO, of course) If going on lesser-used trails or off track, they are absolutely imperative. We are so lucky to live in this country! Chester/Sawmill Trail system – We started at Sawmill Parking and did a 13km loop clockwise – the “Yellow Loop” on my 9 year old winter trail map. This goes through a variety of interesting terrain, with good views in several areas. Sections comprising about 75% of the loop had been recently used by others, while we broke trail in 3-4cm of wet snow in the rest. With the temperature between 8C and 10C, it was a warm and often sticky day – we removed our snowshoes at times to make the going easier. Lots of collembola (snow fleas) – we counted 63,927,441,250 but probably missed some. Got a bit rainy near the end – it will be icy when it cools, until more snow comes. Ray forgot to mention that on our way to Sawmill, just before the Boundary Ranch sign, we saw a large black wolf by the side of the road! That’s a first for us, and there was much excitement in our van. Looking back into the woods showed a second smaller wolf, almost white in colour. Back to the trails…the section that follows James Walker creek was very interesting as the whole area has been devastated by the 2013 floods and looks so different from what we remember. Not sure I’d want to hike that area in summer without the snow to soften the ragged edges! Snowshoed to Chester and on to Elephant Rocks. Trail very packed but not icy. Some people hiking;not many skiers. Temp was about -5 so with blue sky, lovely snow and very few people it was a spectacular day there. Lots of Gray Jays at the lake. Smith-Dorrien road hard-packed; icy in sections (in need of extra gravel!!). Bonus — sighting of moose with calf along Hwy 40. We may have seen you on the trail. I was with a group of 10 women. Saw a moose and calf 2 weeks ago on Hwy 40. Possibly it was the same pair. Well, there are only two reasons for using snowshoes on this trail at this time: first, you do not have ice sandals and need the crampons; second, you really like walking in snow shoes. What I am saying is that the trail today is hard packed and in places sheer ice. Ice sandals worked much better, IMHO. It was a wonderful day to be out, and since the skiing looks lousy, the parking lot had few vehicles. My wife deemed the XC ski trails to be too Chinook affected for her liking, so we opted to wander around a few of the snowshoe trails instead. We went around Snowshoe Hare, wandered up Demi-Tel for a while, then headed back along Snowshoe Hare and short-cut over to the new Whitetail Snowshoe trail. All the trails were well packed from lots of snowshoers, fat-bikers, hikers and trail runners. Snowshoes weren’t necessary, unless you wanted to explore off of the main path. Traction was good for the most part, but there are some thin/icy bits and a few bare spots… generally where there is too dense a canopy of spruce trees. Luckily, most of the forest cover is aspen or widely spaced pines, which means good snow coverage. Took one for the gipper, eh? I approached an old acquaintance from the Bragg Creek Bulletin, who owed me lots of money, to see if more photos of this pioneering snowshoe trip could be unearthed. Our group of 11 ladies snowshoed the Highline Trail to Paradise Creek on Tuesday the 19th and then viewed the ice sculptures at the Lake Louise shoreline. While the bit up to where you turn off on to the summer horse trail was well trodden for walkers, the horse trail quickly became our own trail with just one set of cross-country ski tracks preceding us. This skier seemed to have been a bit nervous as they took their skiis off and walked long sections but then it isn’t an official ski trail so fallen trees and random lumps and bumps appear. No problem for snowshoers but could be trickier for a skiier. The snow was nice and soft, every tree was covered in its own little snow sculpture. 2 skiers and 2 snowshoers appeared while we were eating lunch at Paradise Creek but otherwise we were on our own. Lovely day. These trails are in the Sandy Mcnabb area and currently have enough snow on them to make for good snowshoeing. If you are looking for an easy trail with lots of scenic views and nice forest walks this is the one. The distance is about 9 kms with about 180 m total elevation gain over that distance. The snow is not that deep so it can also be done in micro spikes. I spent the weekend snowshoeing various trails along Highway 93 to Radium. The snow in this whole area is superb for snowshoeing. Pick a trail, any trail and you will be happy. There are all levels of snowshoe trails along this road. A little research and you will find the ideal trail for you. Cross-training day and wonderful catch up opportunity with a good friend snowshoeing up Stanley Glacier Trail. We went as far as the huge rock under the summer waterfall, likely 9 kms. in total. Saw a couple of ice climbers and some young men enjoying their AT and split boards. I find this trail to be more beautiful in winter than summer and way less people. Doubt I will ever try it on my light touring skis. Good Luck Chuck and Jeanette in skiing the Loppet in Salmon Arm this w/e. This really is a classic snowshoe. About 10 k and 400 m, it gives you a good workout. The scenery is diverse with open areas, dense forest and a beautiful lake setting surrounded by snow-covered mountains. The trail is currently well packed but the snow was still excellent for snowshoeing. Not another person on the trail while we were there. Unlike Chester Lake, this trail is more of a gradual uphill with a couple of steep sections. What a great day! We started at the Fullerton Loop side and continued in the order listed above. Total was a little over 10 km with about 300 m total elevation gain. The temperature was a constant -9 deg C with light snow falling. The new snow made for good snowshoeing conditions. This route was through a mixture of terrain that takes you into forests, up and down hills on steeply slopped banks, through meadows and over about half a dozen bridges. The uphill part of Fullerton had some ice under the newly fallen snow. The same was true on part of Tom Snow. Nothing to be really concerned about. We met no one on the trail for the whole time we were there. The new snow was only a few cm thick so I would not say we were actually breaking trail but rather had the enjoyment of being on freshly fallen snow. The last part of the loop from Station Flats Trailhead to our parked car at the Fullerton Parking area was also enjoyable. We followed part of a snowshoe trail away from the road and broke a new trail when there was no trail. This is a very nice summer hike and excellent winter snowshoe. The trail starts from the Upper Kananaskis Lake. The 4 km one way, with 300 m elevation is not bad at all with all of the switchbacks that make up the steep sections. It was cold this morning with- 20 deg C at the trailhead. Given that this was the last day of the holidays and not much snow had fallen, I thought the trail would be well packed. We brought our grips (recommend Micro-spikes by Kahtoola) and Snowshoes. We walked up to Rawson Lake on a well-packed trail. At the lake snowshoes are required if you are venturing farther. Another great day in the mountains. Snowshoed Elkwood loop today. Light snow and -7 made for a great day. There is lots of snow here though the trail is fairly packed. When you get to Marl Lake there is lots of snow to break trail through and get a work out. This was our first time here and it was a well marked, mostly flat easy hike. A few skiers were on the trails but saw no other snowshoers on the snow shoe trail. This area is always a favourite. If you want decent snow go here. The trail was packed. It looked like it hadn’t snowed for a while. But the snow consistency was good for snowshoeing. Start off on the same trail as the Chester ski trail. After about 30 seconds there is a snowshoe sign telling you to go right. The trail is very well marked. Lots of uphill at 300 m in about 4 km to the lake. Distances and elevations vary depending on whose gps is being quoted. Started out at -18 deg C and ended the trip at -9 deg. It is a fantastic area with side trips if you want and beautiful views at the lake. Got an early start as usual so missed the crowds and there were crowds on the weekend as usual. It was a beautiful day and the snow was well packed even though there was 10 cm of new snow a few days earlier. This is the common case in the Bragg Creek area with the now popular use of bicycle travel on all of the snowshoe trails. Grips for your boots are probably the only thing that you need on the snowshoe trails in the West Bragg Creek area. West Bragg Creek snowshoe trails are all refreshed, thanks to 5-8 cm of new snow on Christmas Eve. I snowshoed the Snowy Owl Trail on December 29th. This was my first time to West Bragg Creek. Trail was pretty packed and is obviously frequented by bikers, a few passed us or came at us as we went. It seemed to me that Snowy Owl is designated as a snowshoe trail. Maps were keyed that way and all of the frequent trail markers showed snowshoes only not snowshoes and bikes but is it, in fact, a multi-use trail? Seems to me this could lead to injuries as those fat-tired bikes are pretty quiet and snowshoes on a packed trail are pretty noisy. On a narrow, twisty hill trail a snowshoer could be pretty surprised by a biker and not have time to jump out of their way. Might mean I make this my last trip to West Bragg Creek unless there is a bunch of fresh snow that I think the bikes might not yet be able to navigate until the snowshoers get is packed for them. Lack of track setting at Elk Parking lot and not wanting to play “guess the wax” today, resulted in a great snowshoe up the designated snowshoe trail. Lots and lots of snow on the trail and trees going up. Fine grained, wet snow/rain mix on the return trip. The road was pretty covered and slick coming out, but conditions kept improving the farther down Hwy 40 we traveled. Just rain by the time we were at Barrier, and dry road by the time I was going up Scott Lake Hill heading east. We did try to encourage the two younger women going up the ski portion of Elk to at least travel along the side, as opposed to right up the middle of the trail, but apparently trail etiquette didn’t apply to them. Hope they get some track setting done up there soon! Anyone have any word on the conditions at Sawmill? I checked out conditions on some of the West Bragg Creek snowshoe trails on the north side of the parking lot. The loop included some new sections of Snowshoe Hare, the new Whitetail trail, and Long Distance and Demi-Tel all-season trails and east Telephone Loop. Conditions ranged from mostly soft powder, to snowshoe/FAT-bike packed tread to freshly groomed snow on east Telephone. Great conditions on all of the trails. It’s time to check out the new Ribbon Creek hiking/snowshoeing trail. This gentle trail follows the valley bottom route of the “old Ribbon Creek” trail, but it is now too narrow to be groomed for XC skiing. You can continue west, beyond the Link XC Ski trail, all the way to the North Fork of Ribbon Creek. The new hiking/snowshoe trail along Ribbon Creek is no longer the wide, road-like XC ski trail that it was before the 2013 flood. It is now an intimate, winding, narrow trail that is reminiscent of the Fox Creek trail in Peter Lougheed Park. It crosses back and forth over Ribbon Creek on a series of six scenic bridges. Although the trail is narrow, the valley itself is much more open than before, with large patches of forest ripped out by the power of the flood. The new Ribbon Creek valley trail is mean for snowshoeing, hiking and fat-biking and is too narrow to ever get groomed for XC skiing. It is, however, a perfectly wonderful as a skier-set trail… as long as that one set of stairs is covered with snow! Also, I am surprised the powers that be would put in 6 lovely new bridges where another nasty flood would wash them away?? Snowshoed the new Ribbon Creek trail today (Dec 1). The trail is wonderful, today there was extensive hard rime on all the trees some forming plates as large as 3 cm across. Near the end of the trail at the North Fork of Ribbon Creek the sun came onto the rime causing everything to take on a wonderful back-lit glow. Would highly recommend this trail, today we had the entire trail to ourselves. Snowfall alert for snowshoers! About 20cm of fresh snow has fallen at West Bragg Creek, so conditions will be great for snowshoeing on Snowshoe Hare, Snowy Owl, Snowy Shortcut, Whitetail, Demi-Tel and east Telephone Loop tomorrow. It’s a much shorter drive to West Bragg Creek, than to Kananaskis or Banff! We hiked to Rawson Lake today from Upper Lake Parking in shirtsleeve weather. The trail along Upper Kananaskis Lake is very icy for most of the way. The trail to Rawson Lake is icy in parts half of the way up then becomes compact snow to the lake. We crossed the lake at the outlet stream and sat in the sun for lunch and watched the spindrift and sluffing snow avalanches on Mount Sarrail. Snowshoes are not required, but traction devices are recommended for speedy safe travel. We returned along the lake shore staying off the trail and in the sun. Has any one gone snow shoeing to Healy Pass lately? Could you let me know how the conditions were. Patricia – check also in the backcountry drop-down tab for conditions when considering your snowshoe trips. There are more backcountry skiers than snow shoers “Out There”. Snowshoed to Boom Lake on February 17th. Trail was hard packed but not icy all the way to the lake. Every other group on the trail was just wearing hiking boots with extra cleats of one sort or another. However, on the lake itself, the hikers were breaking through the snow here and there and often there was a layer of slush on top of the ice. With snowshoes we stayed on top of the snow and out of the slush. Had lunch on the lake shore near the first ice fall. It was sunny, warm and comfortable. On the way down the trail we did take off our snowshoes and carried them down. Snowshoed into Rummel Lake today. Constant flurries interspaced with heavier, near whiteout conditions until early afternoon when blue skies started to appear. The trail is in excellent shape, and was shared by both snowshoers and back-country skiers. Everyone smiling. 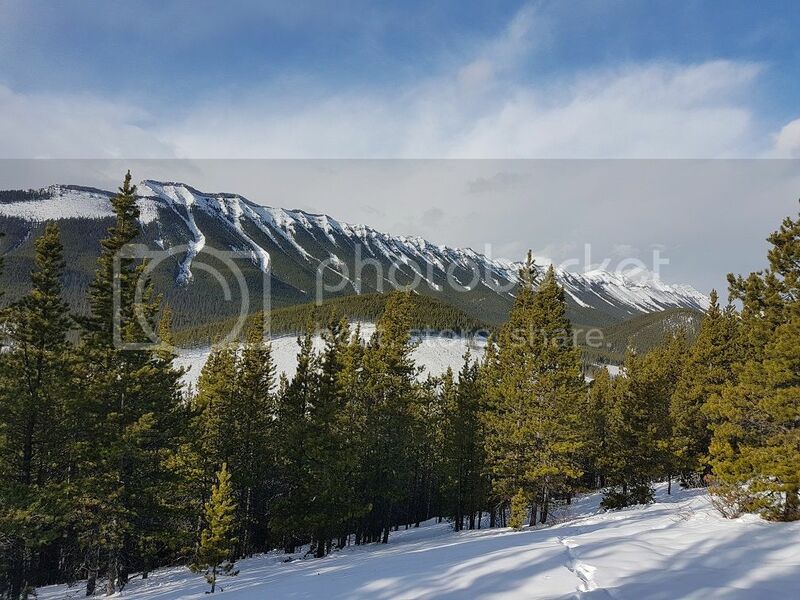 Now, if we can only get that kind of snow condition on the ski trails…..
Could someone let me know if you can snowshoe all the way to Rummel Lake?…is it avi terrain? We snowshoed to Rummel Lake from the Smith-Dorien/Spray Lakes road. We parked by the turnoff to Mt. Engadine lodge. The hike to the lake is about 4.5km, and does not cross any avalanche terrain. If you go beyond the lake, there are avalanche chutes to be aware of. If anyone is interested in a snowshoe race coming up on February 28th, 2015, this is a good one a for an amazing cause too! I want to start snow shoeing as a beginner , can I go to Brag Creek? Where to borrow the equipments? Yes, Bragg Creek is a perfect place to start snowshoeing as a beginner. The trails are extremely well marked with orange blaze markers and there is a trail map at every single intersection. You can rent equipment at the University of Calgary Outdoor Centre, Mountain Equipment Coop or Sports Rent. Travel conditions in the back country are ideal at the moment. Starting at Mount Norquay and ascending to Elk Pass (the one in Banff), is amazing. Snowshoers had figured that out before us, but we went further, and got powder turns on the descent! I just wanted to let everyone know that there are two new snowshoe loops at West Bragg Creek for this winter. I was out on one of them today, with a group of volunteers…pruning branches, clearing deadfall and placing bright orange snowshoe sign markers. The trails are now done and will be ready for the first snowshoers as soon as we get the next snowfall. The Snowy Owl trail starts from the parking lot and goes west along Bragg Creek, roughly parallel to Mountain Road. It crosses Moose Connector, then makes a big loop to the west and south, around West Crystal Line and Loggers Loop XC trails until it intersects the Ranger Summit Trail. Then it goes east and south to a junction at the Strange Brew trail. From the “Blue Bridge” at Mountain Road, the second snowshoe trail branches off. The “Snowy Owl Shortcut” takes a shorter, more direct route to the west edge of “Snowy Owl” trail and provides the option of shorter loops, when combined with “Snowy Owl”. This is how parts of Snowy Owl Shortcut looked today. 1st timer. How do you get there from South Calgary? Are these trails suitable for beginners. From south Calgary, take Highway #8 to Highway #22, then drive south to Bragg Creek. If you live in way south Calgary, take Highway #22X to Highway #22, then drive west and north to Bragg Creek. At the strange pie-shaped intersection/corner on Highway #22, turn west onto Balsam Avenue, cross the bridge and turn left onto West Bragg Creek Road (Township Road 232). Continue west until you get to the parking lot at the end of the road. There are trail maps at every trailhead around the parking lot and at every junction on every trail. The snowshoe trails are clearly marked with bright orange snowshoe markers. You can also snowshoe on any of the 60km of all-season trails…just please don’t snowshoe on the groomed XC ski trails. The easiest beginner snowshoe trail is Snowy Owl/Mountain Road (either 2.6 or 3.7 km, depending on how far out you go). Snowy Owl/Snowy Shortcut makes a 5.4km loop that’s quite easy. Snowshoe Hare is a great 5.3 loop on rolling terrain. The full Snowy Owl snowshoe loop is about 9 km, but you can make shorter versions of it via Snowy Shortcut and/or lower Ranger Summit trail. Lot’s of options! Snowshoed into Chester Lake and to the Elephant Rocks today, under a cloudy sky with constant flurries. Trail is in very good shape, with some evidence of crusting on the lower section – but no problems. Off trail, the crusting prevents one from sinking too deeply into the snow. We had lots of fun scrambling around the rocks. Note – the Smith Dorrien road is starting to soften and have mucky stretches in the afternoons. Snowshoe users have taken over this once popular ski destination. In fact, this route starting at Moose Meadows, is so well travelled, one could easily just walk. We were the only people on this trail today, but that may have more to do with the ice cold forecast! Did you ski or snowshoe the trail Chuck? We skied it, but also recommend it for snowshoe use. Seven seniors from the Evergreen Seniors Outdoor Club snowshoe’d from Elk Pass Parking to Pocaterra Hut (12 km) in 5 hours. We started at the Boulton Creek / Fox Creek trail junction travelling down a good track along Boulton Creek. After approx.1.5 km, we crossed Boulton Creek and started breaking a trail.uphill to Moraine. We crossed through the Boulton Campground and broke trail through the interior PLPP drainage to Marl Lake. At the Amos / Wooley junction we picked up a track set on previous outings and, now making better time, we were soon at Pocaterra Hut. It was -14C at WWL at 10:00 am and stayed fairly cold all day. A great snowshoe trip in a part of PLPP that I have never trod. Highly recommended and requires two cars. Snowshoed WBC this afternoon with a buddy from WI, USA. When we arrived I found I had a serious senior’s moment, having remembered the poles but forgotten the snowshoes. No matter: the trails were really well packed and snowshoes were not needed at all… and no, we did not leave indents. Temperatures were “brisk” at about -18 but the smiles we saw on the faces of thew people we met on the trail said it all: A great day to be out! We did the Highline Trail towards Paradise Creek starting from Fairmont Lake Louise and loved it (we’re new to this sport)! We only went the 3.5 km to the creek, but it was great to be among the trees on a narrow, undulating trail. If anyone is trying the new Loop A beside the hotel, and would like a bit more of a challenge, this is an excellent choice! The trail also extends to Paradise Valley and Moraine Lake road, but we haven’t tried that yet since it’s quite a bit farther. Took the family out at Lake Louise for a first time on “shoes”. All my girls seemed to enjoy the shakedown on “Loop A”; I believe that will get a name via some contest soon. It’s a short trek starting by the Nordic Shop and back to the Hotel via the lake. As a skier mentioned it was quite cold, skated the evening before and it was Friday evening as well. Icy #1 too. BTW, the ice on the lake seems much smoother than previous years for skating. Didn’t have that usual cobblestone bounce. But there were random pits here and there that keep you on your toes. Hope to get them out again to try the Lookout, but, it’s a bit like herding cats…. Nevermind, it did all by itself! Thanks for this Gord. I am curious as to what the layout of the trails looks like after the flood. I use the Sawmill parking lot to access some of the backcountry areas. The last pictures I saw of the area didn’t look to promising. As for the new trail map, it looks as though proper snowshoeing etiquette as been clearly spelled out which is good to see. Making sure it is adhered to would be a different story. We all play a role in ensuring that each trail pertains to a specific activity. Hopefully we see less damage to the groomed trails and a peaceful coexistence between skiers and shoers. This isn’t a trip report, and I’m not sure I’m posting in the correct spot. However, can anyone tell me if it’s worth snowshowing Chester this weekend? The trail report says 24cm on Nov 10th, and expecting say 10-15 on Friday. I’m very new to snowshoeing and will have to rent a pair to go… so I’d like to know if it’s worth it? You should be alright. I believe someone was out there skiing last weekend that posted on here. I haven’t checked the weather in terms of temperature, but it usually is cold enough there that melting shouldn’t be an issue. Myself, I usually wait till December to go when there is a really good base. I went 2 weekends in a row recently (Nov 9th and Nov 16th). Good snow already BUT be sure to take the correct trail off the start! I never went before the floods so I’m assuming the damage caused the beginning to be ‘less clear’. Once you leave the parking lot, about 150-200M up the trail (past the gate) you will see a fork. A wide, well beaten down path goes slowly uphill to the right while a much, much narrower path goes to the left, down into the creek bed and right back up on the other side. Remember the poem and ‘ Take the path less traveled’ aka TAKE YOUR LEFT into the creek! Smooth sailing from there on. The first weekend we wrongly went right at the fork and ended up meeting group after group of people looking for the lake only to find out after giving up and going all the way back to the parking lot that we missed the initial left fork only 3 minutes into the hike! Went out to West Bragg today. Did a loop consisting of Braggin Rights and Long Distance with a little bit of Reconnect thrown in. Enjoyed it enough that I decided to do it again right after, only this time is was Braggin Rights, Long Distance, Demi-Tel and Snowshoe Hare. Braggin had just enough snow to render snowshoeing useless in the higher stretches. The lower stretches in the valley had enough. Other than a short stretch of Long Distance that was the same way, all other trails had a sufficent amount for the shoes. Tried Rockbound Lake trail today on the mini MSR’s and quite icey first 200 m. up. The last 500 m. were much better and started to clump a little at Tower Lake open areas when the snowing stopped briefly enough for the sun to emerge. No signs of animal tracks and turned around where the trail comes rather close to the snow slopes of Eisenhower Tower. This time at the end of the season, I find it perfect for snowshoeing on trails such as Healy Pass. Since I have never skied up to Healy Pass it gave me a chance to check it out before adding it to next winter’s “to do” list. Started at Bourgeau parking lot and went up to the open meadow, 1.5 kms. shy of the Pass. 500 metres elevation was a good workout. Trail snow supported my MSR Juniors, even in the open sunny parts. No animal tracks seen (or people for that matter). Enjoyed lunch in the meadow in heavy wind. There’s still lots of snow for snowshoeing on the Chester Lake Trail. The temperature at the parking lot today was +2. The lower part of the trail was a bit soft but no sign of the ice that Andrew mentioned. It was -4 at the lake with the snow still crunchy under foot. Those big rocks looked pretty amazing all covered in snow against a perfectly blue, cloudless sky. I didn’t see anyone else on the trail but there was one other car in the parking lot when I got there. I think they might have been skiing because I saw fresh ski tracks at the lake. I checked out the lower part of the XC trail on my way out and it was a thin layer of new snow over glare ice. Glad I was on snowshoes today! Decided to follow alongside Graeme’s great tracks up Skogan to top of Screamer. Being in my mini 20″ MSR’s, I noticed a snowmobile trail that had been packed down and chose that easier option. It was minus 6 and a steady climb of 400 m. to Nakiska Mid Mountain Lodge, where I enjoyed watching a few AT skiers doing their S-turns in fresh powder way above the top lift. Ski hill only open on w/e’s. It got sticky on way down and passed a few other snowshoers coming up. It beats the rain predicted for Friday. Guess we’ll all have to wait for skiing up Skogan Pass until next winter. I didn’t know your real name was Jaime Sommers (Google it if you have to). 12 days of not finding anywhere decent to ski, I took the MSR Junior’s (20″ and perfect for “track” snow-shoeing) and headed up Redearth. I still hope for one more ski into Shadow Lake and wanted to check the snow. No one around, the peace and serenity was restored going up to the open meadow just beyond the campground. It was zero at noon and zero where I had some tea, then turned around. 2-3 cms of fresh snow atop of last track-setting about a month ago. The poles were easy to plant so if it had been frozen, it had softened enough. Fun to observe all the animal prints and did not run into any scary ones. I went snowshoeing up to Chester Lake on March 29. The trail was very busy with other fellow snowshoers. The trail was well worn and there was an enough snow to allow for snowshoeing. I found that going up the steep hill was difficult because it was very icy that day. I had to dig my snowshoes into the snow in order to maintain my balance. Once I had made up the hill, I found the snowshoeing more pleasant. Along the way, the views of Mount Chester were spectacular. When I had reached Chester Lake, I was greeted with fabulous vista’s of Chester Lake and Mount Chester. Overall, I would recommend this snowshoe trail to anyone who is looking for an challenge. With the PLPP ski conditions getting so challenging, we decided to snowshoe some trails instead. Starting at Elk Pass parking, we took the snowshoe trail that heads to Elk Pass, but left it along Hydroline where we headed up to Lookout. Its quite a climb, but easy on the edges of the groomed ski trails. Fantastic at Lookout – great views, blue skies, little wind, +6C. After a pleasant lunch, we headed north, eventually returning to Boulton by the Whiskey Jack trail. A 2 Km walk on the road got us back to Elk Pass parking, making for 15Km total. Interesting to get the different perspective of walking trails we so often ski. Hiked Rawson Lake today. The trail up to the lake was very well beaten and did not require snowshoes. Put on the shoes for a tromp to the end of the lake where we watched many avalanches thunder their way down. Kept the shoes on during descent for the grip. Despite weather we drove out to Upper Lake parking in Kananaskis to climb & descend Blueberry Hill. Weather cleared somewhat as day progressed, & we got good viewing conditions atop the hill. As we descended there would have been more views but we were focussed on keeping upright as we twisted & turned through the glading on the way down. I snowshoed the Chester Lake trail on Sunday with a group of friends, and hundreds (literally!) of other snow adventurers (including skiers and walkers). What a busy trail it is, I have never expected to see so many people on a winter day. The trail itself is very well packed yet still soft (meaning not icy), and does not really require showshoes (spikes may be beneficial though), unless you want to venture into the woods off the trail. Snow depth is more than 1.5m (5 ft) as my poles went all the way down when I tried it. Trail to the Elephant Rocks is well defined as well. Went snowshoeing at Sandy Mcnabb today. Did a quick trip on Death Valley Loop. Snow is marginal to nonexistent in places and in some areas it was decent enough to not be kicking up debris but felt like I was walking on plywood. Probably could have done the loop without the shoes. Came across both wolf and cougar track and the weather was absolutely gorgeous. Good day to be out. Snowshoed the Elkwood Loop today. The designated trail is all packed by snowshoers & we added our usual variation with a circuit of Marl Lake, lunch-with-a-view in the sun by the lake. Snowshoed Sawmill to Chester Lake today (Dec 30). Conditions on the Sawmill trail were good to excellent with good snow depth. I got started a little later than I wanted to. My thighs wouldn’t let me out of bed as I didn’t do a proper pre-shoe stretch before my outing yesterday ( See my comments for West Bragg under Snowshoe). Otherwise I would have been able to go further. Spent just under 8 hours in snowshoes today for a total distance of 13.7 miles. Not bad for the last trip of the year. Bring on January 1, 2013! It was nice to see a lot of people out on the Chester Lake trail. Some with dogs and a lot of kids. Really nice to see. We truly are blessed with having the biggest and most beautiful outdoor playground with in an hours drive of Calgary and am truly thankful for all the experiences and opportunities that wait in my adventures out there. Some suburb snowshoeing conditions right now for sure! Have tried snowshoeing off-trail down a couple of creeks, Chester & James Walker (off the Smith-Dorrien/Spray Lakes Rd.) & eventually had to abandon the goal of getting back to the road. Maybe later in the season the snow accumulation will smooth those routes out some more. Monica Brook, on the other hand, down from the meadow below Tent Ridge was great much of the way. The last bit close to the Mt. Shark Rd. & the route up – there’s supposed to be a more open approach – to the Tent Ridge meadow not so pleasant. The route into Sherbrooke Lake just W of L. Louise was packed by snowshoers on Sat. (Dec. 8) & the loop E from Ross Lake – also just W of L. Louise – was packed on Sun. (Dec. 9). I snowshoed up to Tower/Rockbound Lakes on Sunday (Nov 18). Trail is mostly snow covered but snowshoes aren’t really needed for the first 4k or so. Beyond that to Tower Lake the snow gets deeper but there is a good well packed trail. Unfortunately for me the big group that did such a wonderful job at grooming turned around at Tower Lake leaving me to break the trail beyond to Rockbound Lake. Its now broken in and my legs are tired. About 2-3 feet of snow at the lakes. Really fluffy unsupportive stuff too, in spots I was sinking up to my knees even with the snowshoes. Also the boulder field by Rockbound has a few invisible traps you can fall into, the snow bridges have no strength. If anyone asks I was deliberately making snow angels. It was myself and six friends that cleared the way to Tower Lake for you. We had chatted about trying to get to Rockbound Lake but we were exhausted by the time we reached Tower Lake and it took us longer than expected to get there. We took turns breaking trail and it was hard work being our first snowshoe trip of the season. I really wanted to see what Rockbound Lake looks like at this time of year but no luck! I snowshoed up to Taylor Lake (south of Lake Louise) yesterday (November 12th). There were some existing tracks there, both snowshoe and ski. At the beginning, there was just enough snow to allow snowshoeing, but within a kilometer or two, the snow depth was sufficient to require snowshoes. It was great travel up to the lake, with light snow and some sunshine. Up at the lake, there was over a metre of snow, and absolutely fabulous views of the mountains rising up from the far shores. Overall, I would recommend this trail as a great early season destination.